This tutorial will show you how much fun and easy it is to create a background paper for inchies, ATC's even greeting cards. You can either use foam picnic plates, if you use meat trays from the grocery store I highly recommend that you disinfect them before you do your project. I WILL NOT be held responsible if you do not do this before hand. I used to work in a lab and believe me I have seen a lot and know how people can get sick, this you do not want to happen nor do I.
Ok that said, think of a simple design that you want to make a stamp image. Here I used a strip of foam and drew spaced circles, the other is a simple leaf shape with swirls and lines. If you make a leaf or flower shape cut that shape out first then proceed to make your lines. I used the end of a smaller paint brush, the rounded end to make the lines. It does not tend to rip up the foam. Make sure you make a good impression in your foam. Gather your supplies together, a plastic lid or something for a palette, some paints, a couple foam brushes and some paper and of course your stamps. 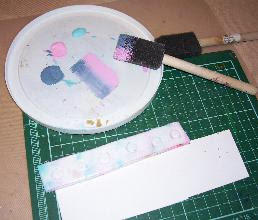 Next squeese some paint onto your palette, here I chose my wintery blue and pink and I do have aqua on there but never did use it. Dampen your sponge brush just slightly but not wet, if it is too wet the paint will go on sloppy on your paper and believe me...been there done that you really don't need any water at all. 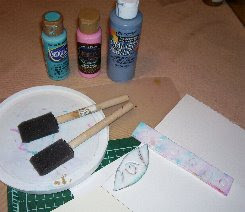 Load up your brush and as you can see here, I double loaded up pink and blue on my brush. Now in an up and down motion I applied paint and as I went along I blended on the foam stamp so it wasn't so solid looking. 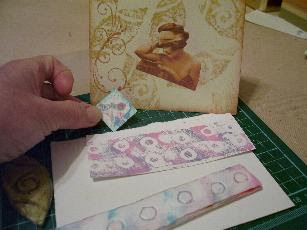 Then take the stamp and press onto your paper and lift up. Now keep stamping until your page is filled up or you have the desired look you want. I rather like a distressed look to my projects, it doesn't have to be solidly filled but if you want to have that look by all means put more paint on. Remember tho if you do use water it will be runny looking. 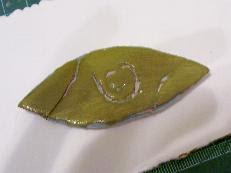 Here I have used Timberline green to show you the leaf print and although when I was finished it wasn't what I liked and the paper got tossed but here you can see how this stamp looks. A nice tan colour on cream coloured C/S (cardstock) looks pretty as you will see in my last photo. 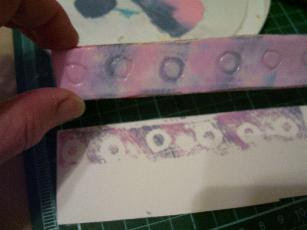 Again apply paint then press onto paper, lift and take a peek. Oooo not sure I like this green on here....way to drastic...have to toss that baby out. And the finished pieces with my backgrounds. A nice card and a little inchie with a small dragonfly stamped over top with some glitter. Ohhh aren't they pretty? Now lets see what you do with your new background papers. Try this out and leave me a comment or better still send me a pic. If you have any other ideas how to embellish let me hear too. 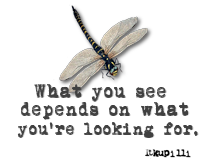 I love to share and create and I hope you do as well. the word veification is acting up , maybe why you have no comments! Oh I didn't know that Jen. 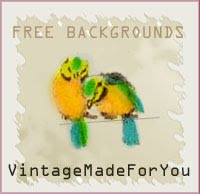 This little tut is fun, try it, easy peasy and love the various backgrounds you can do.